Manila, Philippines - The weather bureau PAGASA announces that Filipinos will experience longest day today, June 21, 2014 due to astronomical phenomenon called Summer Solstice. 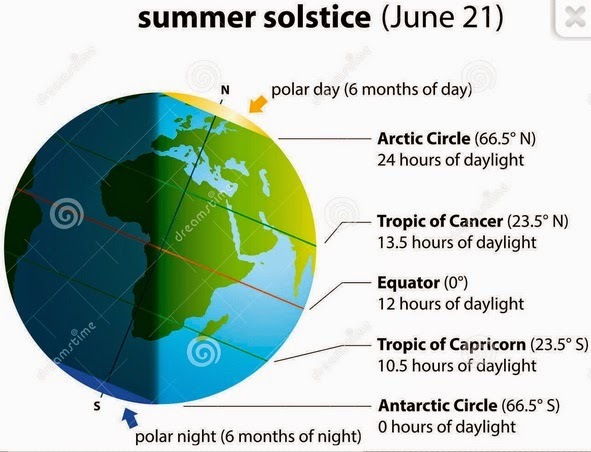 On its official website, it says that Philippine nights are at their shortest and daytimes are at their longest around the Summer solstice, which falls on June 21 at 6:51 P.M. (Philippine Standard Time). The daytime will last for 12 hours, 59 minutes and 36 seconds. The Summer Solstice is officially the longest day of the year. The word "solstice" is Latin and comes from "sol" and "sistere," which means "sun stands still." This is the time when the Sun attains its greatest declination of +23.5 degrees and passes directly overhead at noon for all observers at latitude 23.5 degrees North, which is known as the Tropic of Cancer. "This event marks the start of the apparent southward movement of the Sun in the ecliptic.,"PAGASA added. In the latest forecast issued at 5:00 AM today, PAGASA said that Southwest Monsoon is affecting the western sections of Luzon. Metro Manila, MIMAROPA, Ilocos region and the provinces of Cavite, Batangas, Bataan and Zambales will experience occasional rains. Mindanao will have cloudy skies with light to moderate rainshowers and thunderstorms. The rest of the country will be partly cloudy to cloudy with isolated rainshowers or thunderstorms. Moderate to strong winds coming from the southwest will prevail over Luzon and its coastal waters along these areas will be moderate to rough. Elsewhere, winds will be light to moderate blowing from the south to southwest with slight to moderate seas.